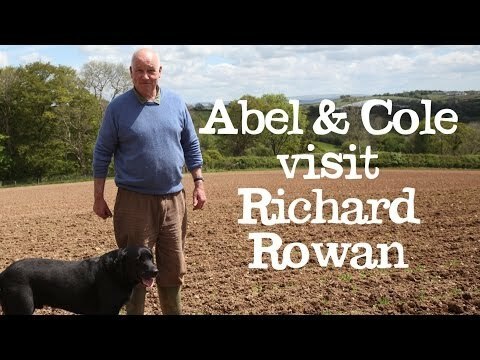 Over many hills and far away (East Cornwall to be exact) is Richard Rowan’s farm, Coombe Lynher. It sits in the valley of the river Lynher, off the beaten track. From Richard's wisteria fringed porch you look out on to his traditional bucolic farm, and land that his family have farmed for over 100 years. And for the last 30 years Coombe Lynher has been organic. We're down on the farm to talk about his crop of big leaf spinach, and the benefits of growing veg organically. "I believe that organic farmers are more committed to the soil. Organic farming is a challenge. It's more expensive to grow things, they take longer to harvest and the chances of things not going very well are high," explains Richard. "But, when they do go well, it's really rewarding. Organic farming takes real commitment, which I have. And it's the future." When spinach is grown on conventional farms, it's one of the most highly sprayed of all veg. Richard's has never been near a drop of agrichemical pesticides and his crops are hand picked. When he’s not growing all things big, leafy, green and handsome, Richard walks around the surrounding woodland. “It's really apparent that there’s more wildlife on land that’s organically farmed. I can hear the birds twitting away now. There’s a real abundance of birds, bees and insects and it’s clear they’re attracted by organic farming.” Where Richard goes on the farm, so does chocolate Lab Bruno. Richard admits Bruno’s a bit bigger due to them sharing biscuits. We reckon that it’s Richard’s spinach they should be sharing a lot more of – one taste of it and you’ll see why.